A 3-year-old male child presented with left ear ache with hearing loss and left facial and abducens palsy for 4 months. There was no history of ear discharge, altered sensorium, ataxia or seizures. The examination revealed congested external auditory canal and VI and VII nerve palsy on the left side. The tympanic membrane could not be visualised. The HRCT temporal bone was suggestive of infiltrative lesion in left ear with bone destruction [Figure 1]a. The MRI brain showed a lesion in the petrous extending in the cerebellopontine angle and temporal fossa [Figure 1]b- d. The left mastoid exploration with debulking of the mass was done. There was infiltrative fleshy vascular tissue in aditus, attic, and antrum with gross destruction of the posterior canal wall. Partial decompression was achieved. 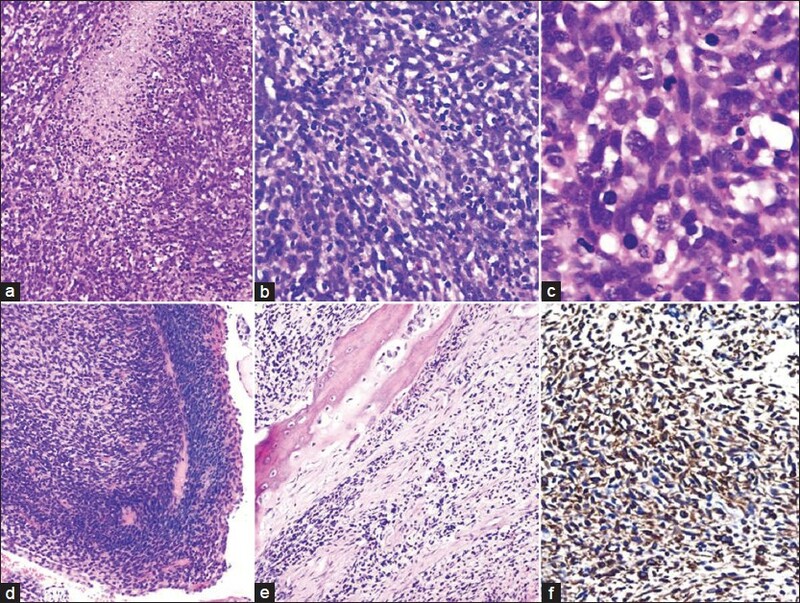 The histopathology was suggestive of 'embryonal rhabdomyosarcoma' [Figure 2]a-e.
Postoperatively, the patient had persistent altered sensorium with features of raised intracranial pressure. The computed tomography (CT) scan revealed hydrocephalus for which patient underwent VP shunt. The patient received chemotherapy (Ifosfamide, Vincristine, Actinomycin-D, Doxorubicin) along with 36 grays of radiation. After about 6 months of the primary surgery, the patient's neurological status deteriorated and features were suggestive of "locked in syndrome", necessitating withholding further chemoradiation. His cranio-spinal MRI was suggestive of diffuse leptomeningeal spread with minimal lesion seen at the primary site [Figure 3]a- c. The child expired in 1 week. Secondary central nervous system (CNS) involvement in head and neck rhabdomyosarcoma is a known complication and is usually seen as leptomeningeal spread, though primary CNS involvement is rare. ,, Such spread is usually rapid and fatal. Cerebrospinal fluid (CSF) from lumbar puncture and radiological screening in cases of rhabdomyosarcomas, even when not in parameningeal location has been suggested. In parameningeal location, regular CSF examination for malignant cytology and craniospinal screening is of paramount importance. Use of craniospinal irradiation and chemotherapeutic drugs that cross the blood brain barrier has been suggested in case of metastatic or parameningeal rhabdomyosarcomas, though the involvement of CNS may not be apparent. , Most of the chemotherapeutic drugs used in our patient have good CSF penetration. Despite all these drugs, the patient developed leptomeningeal metastases and had a poor outcome. This report highlights the spread of rhabdomyosarcomas through CSF pathways after intracranial extension thereby making cranio-spinal screening important. Besides, diffuse leptomeningeal spread is poorly controlled by chemotherapy and usually bears a poor prognosis. 1. Gerson JM, Jaffe N, Donaldson MH, Tefft M. Meningeal seeding from rhabdomyosarcoma of the head and neck with base of the skull invasion: Recognition of the clinical evolution and suggestions for management. Med Pediatr Oncol 1978;5:137-44. 2. Shellenberger TD, Sturgis EM. Sarcomas of the head and neck region. Curr Oncol Rep 2009;11:135-42. 3. Dropcho EJ, Allen JC. 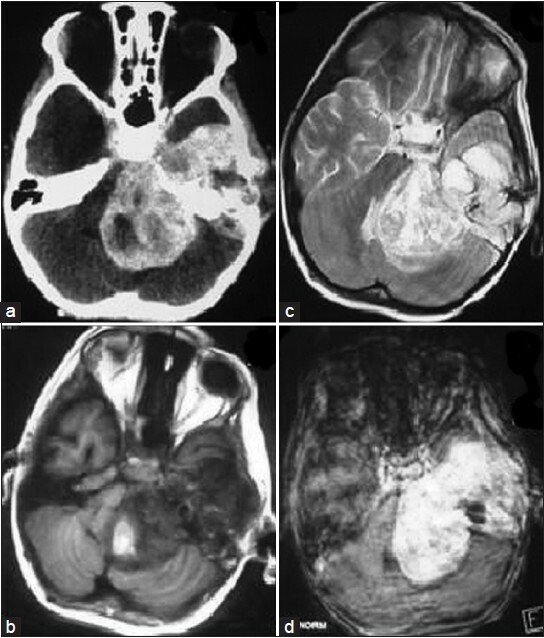 Primary intracranial rhabdomyosarcoma: Case report and review of the literature. J Neurooncol 1987;5:139-50. 4. Arush MW, Kollender Y, Issakov J, Shalom RB, Arieh YB, Malkin L, et al. 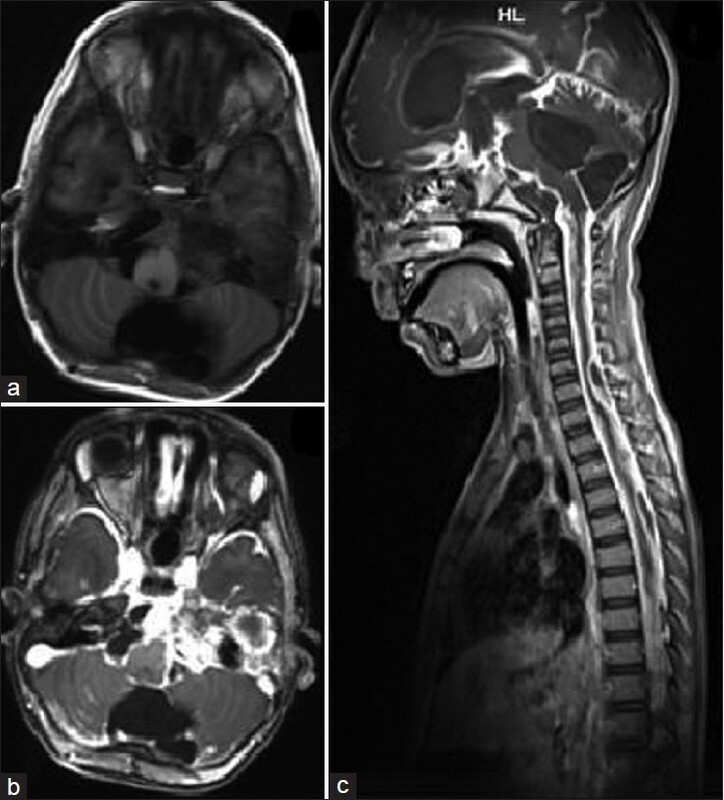 Unusual leptomeningeal dissemination in a child with extracranial metastatic alveolar rhabdomyosarcoma. Pediatr Hematol Oncol 2009;26:473-8. 5. Ahola DT, Provenzale JM, Longee DC. Metastatic rhabdomyosarcoma presenting as intracranial hemorrhage: Imaging findings. Eur J Radiol 1998;26:241-3.